Russell Means, the most famous American Indian since Sitting Bull and Crazy Horse, survived 13 assassination attempts during his life-long fight for freedom. The life of Russell Means is a riveting journey that reveals itself through a series of courageous acts and almost unbelievable twists of history and fate. After briefly reviewing Russell’s illustrious Lakota ancestry, the story tracks his formative experiences as a young Indian boy enduring the racism and bullying of white society in the San Francisco Bay area. The movie explores Russell’s involvement in activism from the first occupation of Alcatraz in 1964 through his rise to leadership of the American Indian Movement and the siege and trial of Wounded Knee ten years later, followed by a dozen more criminal trials in the government’s fruitless quest to put Means behind bars for good. Following the 4-year reign of terror that targeted AIM members on Pine Ridge after Wounded Knee, and which resulted in the world’s highest per capita murder rate, we explore Russell’s rejection of violence in favor of creating revolutionary change through more peaceful and enduring methods. 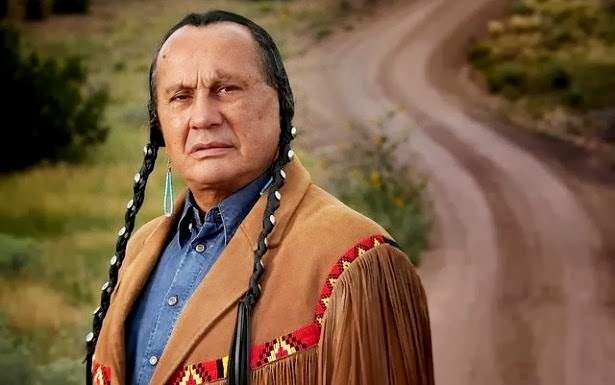 The film will illuminate the many different methods and talents Russell Means used to galvanize the immense power of the media in his fight for freedom, making an impact through acting in Hollywood blockbusters, writing, painting and fine art, political protests and campaigns. He is perhaps most widely noted for several historic speeches that have elevated him into the pantheon of great American statesmen. Few individuals in history have had such a powerful and lasting impact on humankind’s quest for liberty and freedom. Conspiracy To Be Free Full Teaser from Lifted Films on Vimeo. Responses to " Russell Means, the Movie: Watch 20 Minutes of 'Conspiracy to Be Free' (Video)"